The promise of Cake is introduced by GLaDOS as an incentive for Chell to complete the test chambers in the original Portal. It is referenced in many of the Rattmann's dens as "a lie", sparking the internet meme "The Cake is a lie". The Cake can be seen at the end of Portal in a room surrounded with waking Personality Cores and the Companion Cube. The cake is spoken of frequently throughout Portal. It is often mentioned through dialogue as well as Rattmann's wall art in his dens. Although the dens frequently claim that the cake is in fact a lie, the ending of Portal shows the actual cake. In addition to the simple mention of the Cake, an actual recipe is given. The recipe can be found on several computer screens after Chell's escape from death. Additionally, during the battle with GLaDOS, the Intelligence Core will recite the recipe for the Cake. The recipe often contains inedible or undesirable ingredients, such as "fish shaped ethyl benzene" or "cranial caps." The cake is referenced again in Portal 2, but much more infrequently. The earliest reference to it can be seen on computer monitors; it's recipe is displayed amidst gibberish. Another is referenced once through a sticker on the fake door before GLaDOS takes Chell to her chamber, mentioning that she "...honestly, TRULY didn't think [Chell would] fall for that." This contradicts the common notion that GLaDOS may have forgotten about the cake after the destruction of the Intelligence Core. A typical Black Forest cake. The cake does not appear in Portal 2 as it did in Portal 1, Erik Wolpaw stated that it was removed because he and Valve were tired of the memes and had enough of cake jokes. However, in the third level of Portal 2, there is a rat man den that has a drawing of part of the cake. The cake slice icon shown on the neon panels throughout Test Chambers in Portal appears in another Valve game, Alien Swarm, as the icon of the achievement "Perfect". The icon has also appeared on the TF Birthday Noise Maker item's icon in Team Fortress 2, with the cherry removed. 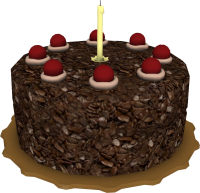 The cake was put in the game as inspired from the Black Forest cake sold in a bakery near the Valve headquarters. An alternative recipe is given during the credits of LEGO Dimensions; its ingredients are edible, save for the final ingredient. This page was last modified on 19 August 2018, at 02:24.